The Dow Jones index closed above 15,000 for the first time as strong German factory data pushed US and European share markets higher. The Dow rose 87 points to 15,056. It has been rising rapidly over the past six months, and was boosted by better-than-expected jobs figures last week. Other world markets also gained, with Germany's Dax hitting a fresh record, rising 70 points to 8,182. Hopes of further central bank action to boost growth also lifted sentiment. Earlier on Tuesday, the Reserve Bank of Australia cut its benchmark interest rate to a record low 2.75%. This followed comments on Monday from Mario Draghi, head of the European Central Bank, that the ECB stands "ready to act again" if necessary, after cutting interest rates last week. London's FTSE 100 was up 0.6% and France's Cac 40 rose 0.4%. Earlier, Japan's Nikkei 225 index went above 14,000 for the first time since mid-2008 as government efforts to weaken the yen boosted exporters. US markets have been on a winning streak recently, lifted by good economics data. Most recently, Friday's labour market data showed that 165,000 jobs were created in the US in April, some 20,000 more than expected. The Standard & Poor's 500 closed at a record high for the fourth day in a row on Tuesday, up eight points to 1,625. "We don't think people are giving enough credit to the strength of the economy,'' said Ryan Detrick, a senior technical strategist at Schaeffer's Investment Research. Tuesday's market gains were also boosted by some positive earnings results by accessories retailer Fossil Inc and DirecTV. Both the Dow and the S&P 500 have now gained 20% since November. Germany's Dax hit the new record after surprisingly strong industrial orders figures for March. Orders for goods grew 2.2% in March compared with the previous month. February's level was revised down 0.1 percentage points, but still showed a 2.2% rise. "Today, it is really difficult not to use superlatives for describing the latest German new orders data," said Andreas Rees, chief German economist at UniCredit Research. Elsewhere the FTSE was up after HSBC, Europe's biggest bank by market value, said profits more than doubled in the first quarter as it benefited from recent restructuring efforts, and booked less bad loans. In France, investors welcomed announcements of additional cost-cutting efforts by Societe Generale and Credit Agricole to boost their bottom line. Market sentiment in Europe was also lifted after Portugal issued 10-year government bonds for the first time since it received a bailout two years ago, which represented a milestone in its efforts to regain investor confidence. Strong demand at the bond sale suggests the country is on course to exit its bailout. European Central Bank policymaker Yves Mersch called the bond issuance an "enormous success". Yields fell to around 5.5%, lower than the 7% which is considered to be economically unsustainable for a country to repay its debts in the long term. The 3.6% rise in Japanese shares came as investors returned from a three-day weekend. 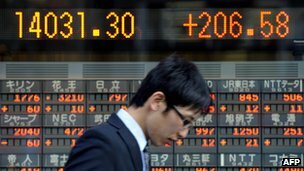 The Nikkei gained 486 points to close at 14,180. "Japanese investors returned from Golden Week national holidays in buoyant mood, bidding stocks in the Nikkei 225 average to their highest since mid-2008," said Andrew Wilkinson, chief economic strategist at Miller Tabak. Japanese shares have rallied since the Bank of Japan announced new measures to pump liquidity into the financial system in an effort to get the country out of two decades of deflation. That has weakened the yen against other currencies. The Japanese currency has fallen 15% against the dollar, making exporters more competitive as their products are cheaper when sold overseas. For every yen that drops against the dollar, Toyota, for example, says its annual operating profit rises by 35bn yen (£230m).